Meihua quan is an ancient style of Chinese boxing which existed as early as the Shang Dynasty (1600BC- 1046BC). According to a legend its boxing style is based on the Kunlun school and belongs to “Buddhist sect and Daoist schools”. For thousands of years Meihua quan had been practiced as a secret martial art in tightly knit organizations, maintaining the internal unity. That had brought fine traditions and outstanding skills to the Masters of the past. Knowledge has been passed on to present day masters’ and currently Meihua quan is characterized by a family like atmosphere where practitioners of different level consistently help each other to improve on their levels. Tianmeng academy is one of the rare places in the world where you can learn this very old and traditional style of Kung fu.The Masters at the Academy are very high educated in this field both theoretically and practically. The study follows the same gradation and structure as described below. 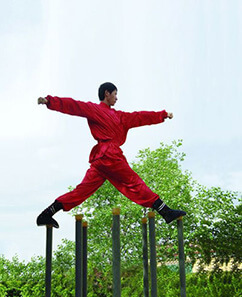 As additional training in the study of Meihua quan the Academy provides special Meihua poles (stakes) with three different heights for beginner, intermediate and advance students. 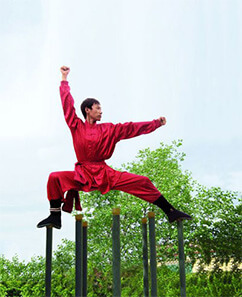 Practicing on the poles enhance student’s Kung fu skills in a unique way not comparable to any other styles. The training methods are comprehensive and efficient. The study of Meihua quan consists of two parts: the theoretic field and the martial field. The theory is derived from ancient scriptures and documents which have been handed down from generation to generation. 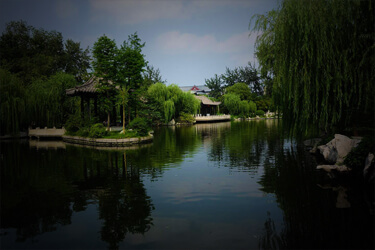 It is closely connected with the essence of Daoist, Buddhist and Confucian doctrines as well as the principles of “The Book of Changes”. The knowledge and practice of this all four religions – philosophical traditions bring wholeness and harmony in humans essence (jing), internal energy (chi) and spirit (shen). The martial field of Meihua quan develops the martial skills and teaches the theory of boxing. 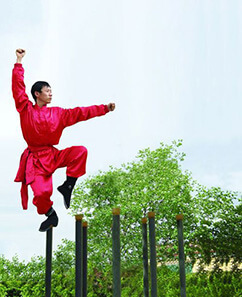 The martial skills consist of: framework (jia zi), footwork at eight directions (ba fang), duel-training boxing (cheng quan), winning boxing (yang quan), weapons and qigong. JIA ZI is the routine for basic Kung fu training in Meihua quan and consists of stake stances and moving steps. The stake stances should be stationary, each stance should be held motionless for 3-5 breaths, thereby developing strength and Qi in the whole body. The stake stances (zhuang bu) are left- right symmetrical postures and are called Da Shi (big stance) ,Shun Shi (fluent stance), Ao Shi (twisted stance), Xiao Shi (small stance) and Bai Shi (failing stance). These five stances are based on the theory of generation and restriction of the five elements Metal, Water, Wood, Fire and Earth respectively along with Yin-Yang theory. The stake stances should remain as motionless as a mountain alternating Yin and Yang, while the moving steps should flow like the waves of a river in an endless stream. The moving steps (xing bu) are dynamic and should be swift, accurate, light and continuous. 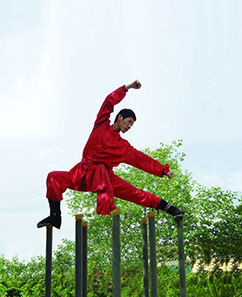 The main training method consists of Bai fa (swinging method), Che fa (retreating method ) and Zha fa (stabbing method). In short these three kinds of moving steps are very useful footwork drills to develop the ability to leap, advance and retreat in all directions, to twist one’s stance and upper body , to turn to the left or right, and etc. In practical use, the three methods enable the practitioner to move like the wind, stand like a nail, rapidly change from a high position to a low attacking position and retreat quickly after attacking. Si men (four doors) is a basic pattern of the Jia zi and contains eight directions according to the four cardinal points and the intermediate directions. The five stances are performed in each of the directions (called also ” corners”).The pattern looks like a plum flower in full blossom. The static and the dynamic elements of Jia zi have a corresponding simultaneous effect on the internal organs , the external body and the flow of the Qi. BA FANG is footwork unique to Meihua quan . There are three types of ba fang- small, middle and big .This kind of footwork can enable the practitioner to move in every direction, advance or retreat , attack or defend. CHENG QUAN (duel – training boxing ) is a set of movements for duel training. These movements are assigned to the eight directions of the four doors ( Si men ) and connected by moving steps and Ba fang steps. In Cheng quan boxing ,there are combat training routines similar to real fighting, including techniques such as grabbling, punching, tumbling, sinking, rolling and wrestling. Through Cheng quan training , the practitioner can learn to feel the strength of the opponent transform the strength of the opponent and estimate the depth of the strength of the opponent. In this way ,practitioner can gain a high sense of intuition. YING QUAN (winning boxing) is an actual spar. At this level, the two practitioners do not follow set handwork or footwork but use rapid movements ,interlocking footwork and skillful handwork. In combat, defending is attacking, attacking is defending and victory to failure is a matter of seconds. WEAPONS: Meihua quan includes not only the 18 kinds of traditional weapons and their complete routines ,but also the practice of rare weapons.Weapons can be performed in duel by two practitioners according to the “Four door “(Si men) and the eight directions. Their movements are unusual and are uniquely tied together with close knit footwork. QIGONG: Besides the practice of martial arts and weapons which train both the internal organs and the external form simultaneously , Meihua quan also includes special Qigong training methods known as Neidan (internal elixir) and Waidan (external elixir).When the external form is formed and the internal Qi and spirit are well coordinated, Neidan is formed. Meihua quan Qigong contains methods about nourishing and feeding on Qi, such as ”Small Circuit qigong”, ”Eight section brocades“, “Twelve section brocade“, ”Changing tendon Method“. It also contains many methods on how to concentrate the attention ,conduct “Qi“, regulate breathing and clearing the mind of random thoughts. All are excellent methods to train the calmness, Qi and the spirit. 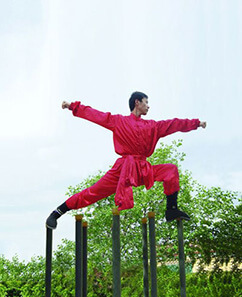 STAKE KUNG FU (Zhuang gong): In ancient times, Meihua quan was practiced on the top of stakes that were driven into the ground. The stakes are divided into three levels corresponding to the practitioner’s level: low, middle, high. The benefits of practicing over the stakes are numberless: balance of the body,deep sinking into the stances , increasing the strength and Qi of the whole body, natural treating of pressure points on the feet, detox and etc. “The real art is invisible “. If one arrives at the state of ” Wholism ” it means one has captured the “real art“. This is the most advance stage. Today we want to reveal the mysteries of Meihua quan to the world, which could only develop and progress from it. From ancient times till now all practitioners of Meihua quan are part of One Family with high respect between each other, deep traditions and endless inspiration. An outline of the daily training schedule is given below. Class times change slightly with the seasons and teaching plans may be personally adjusted for individuals according to their training program or goals. – The history and basic theories of Meihua Quan: BasicMeihua Quan theories from literature including Yin and Yang, Wu Xing(Five Elements) and Ba Gua(Eight Trigrams), the twelve meridians and collaterals. – Five static stances(Da Shi, Shun Shi, Ao Shi, Xiao Shi and Bai Shi)，Meihua Quan Wushi, Ba Fang footwork (Small Bafang, Middle Ba Fang and Big Ba Fang). – Basic skills of Meihua Quan include fist techniques, leg techniques, waist techniques, footwork and healthy promoting. – Jia Zi.Training in single, pairs and groups. – 6-18 sets of Cheng Quan training and 6-24 sets of Qin Na(Grappling) training. – 1 to 3 Usual Weapons(18 Weapons) and 1 to 3 Unusual Weapons. – Soft Qi Gong and Hard Qi Gong. In this stage, the goal is to make your body move flexibly and to convey your intention from your mind and your internal energy with breathing by linking your mind and intention, etc，your arms, eyes, footwork and the entire body could finally become coordinated harmoniously. In addition, you will be able to use hard Qi Gong to break a house brick in two with your bare hands. During the evening classes you will learn basic Chinese, Chinese culture, Buddhism and Taoism theory, calligraphy, tea ceremeny and acupuncture and massage. – Furthur Jia Zi training. – 18-72 sets of Cheng Quan training and 24- 108 sets of Qin Na(Grappling) training. – 3-8 Usual Weapons(18 Weapons) and 3-8 Unusual Weapons. – Soft Qi Gong and Hard Qi Gong further training. In this stage, you are able to make it to practice both your muscles and internal energy. And the Hard Qi Gong including breaking wooden staffs over your legs and arms and bricks by your elbow or knee or head with no injury can be done. During the evening classes you will learn more advanced Chinese, Chinese culture, Buddhism and Taoism theory, calligraphy, tea ceremony and acupuncture and massage. In this stage, you will achieve the “Three Internal Coordinations” (neisanhe). These are coordinations between mind and intention (xin and yi), intention and internal energy (yi and qi), internal energy and strength (qi and li). It is the higer stage of Meihua Quan in practical fight and will make your fist, footwork move too fast to be clearly seen in the fight. Constant advanced training will bring out all-around development of the waidan and the neidan, and practitioners’ martial arts have reached the profound stage where internal energy and mind are unified. This is the advanced level of Meihua Quan and will make you reach the most profound stage of theory and skills of Meihua Quan gradually. Do you want to learn Meihua Quan?